Esoteric Buddhism with his first master, Lama Da-De at Yong-He Palace when he was six years old. At the age of seventeen, His Holiness Lin Yun left Beijing and returned to Taiwan, where he studied with two great masters of Black Sect Esoteric Buddhism, Master Hui Chieh-fu and Master Cheng Kwei-ying. His other teachers were distinguished philosophers, artists, and scholars, such as Professor Cheng Ti-hsuan. He also held a B.A. in Law from National Taiwan University and a B.A. in Urban Planning Administration from Cultural University. 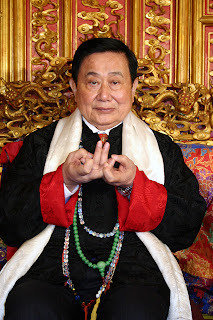 His Holiness Grandmaster Lin Yun was also well-known for his unique, valuable and comprehensive teachings. Through the integration of Buddhist teachings, Yin-Yang philosophy, the theory of Ch'i, Feng Shui, spirituality, holistic healing, transcendental cures, and Chinese folklore, His Holiness Lin Yun developed his own unique and efficacious teachings, also known as Black Sect Esoteric Buddhist teachings. Furthermore, through the use of contemporary knowledge to interpret ancient Chinese wisdom, His Holiness was able to make his teachings much more receptive, adaptable and applicable to the modern world. He revived and reinvigorated the ancient Chinese wisdom of Feng Shui and folkloric culture and transmitted his teachings to the West. Buddhist temple at its fourth stage in the West. In 1994, he established the Yun Lin Temple Cultural Center in Berkeley, California. In 1996, H.H. Grandmaster Lin Yun established the second official temple, Lin Yun Monastery, in Long Island, New York. In 2008, the Taipei Temple was inaugurated in Neihu, Taipei, Taiwan. Since the early 1980’s, numerous sanctuary shrines known as “Yun Shi Jing She” were also set up in different parts of the world.